A happy fourth of july to any American readers ! Today, as a good enough excuse as any for me I am holding a little American beer tasting session tonight with a couple of friends. Along with pulled pork, ribs and wings on the menu...I feel American already, how do I win a green card ? Wafts of grapefruit, peaches and hops from the pour. 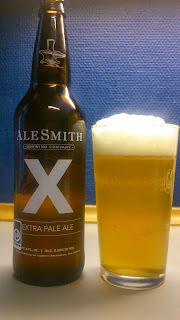 Alesmith X pours a hazy yellow gold with a fluffy white head. Citrus, pine, lemon peel, floral hops and peach syrup in the background on the intake ending in a light bitter finish. Grapefruit, lemon and pale malt linger in the aftertaste. Nice light mouthfeel without being watery. Very nice tasting pale ale to start the day on. Easy to drink and here is that word again...refreshing. I would have no problems buying this again(overpriced) or drinking this on a session. My only gripes are there are many comparable or better craft pale ales available this side of the pond for a lot less money so I am not so sure this has that extra going for it despite the high score below as there is no wow factor for me to make it stand out. This scored 8.5/10 on the 'is that speech in the movie 'independence day' the most cringeworthy ever ?' Beerometer. Where to buy CPH : Høkeren, Ravnsborggade 13, Kbh N....also seen in Kihoskh.